Check the "What's New list top right as new articles appear often. Encased coins are classified as a token. Tokens include, but are not limited to love tokens, encased tokens, elongated cents, and trade or advertising tokens. 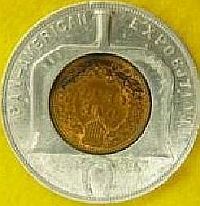 Encased coins are recognized by TAMS (Token and Medal Society) as trade tokens as they have the implied value of one cent. Encased coins are generally recognized as those that are encased in a metallic ring. However a wider definition might encompass any coin encased in another substance as long as the coin is visible. So what else qualifies? How about coins encased in plastic as a paperweight? 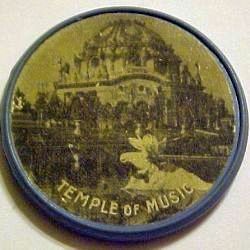 Or coins encased in pocket mirrors as advertising pieces. Key chains with plastic coated coins, belt buckles, jewelry, clocks and other encasements. Slabbed coins (graded by a grading service) are NOT encased coins as the encasement of the coin is to protect it from environmental factors and to assure the buyer and the seller that the coin is certified as to grade, condition and authenticity. Do you know of other shapes? I am particularly interested in using this site to build the body of information about encased coins. There are very few books about them. The best known is "The Penny Man" by Bryan G. Ryker. It tells the story of Frederick Earl Fankhauser who sold encased cents to businesses. He added his name to many of his pieces allowing us to attribute these pieces to him. He lived in Fort Wayne, IN and many of his pieces are from Fort Wayne and the surrounding area. There are other pamphlets/catalogs listing pieces from various states and an extensive Maverick index. What is a "Maverick"? Encased coins as advertising pieces usually have a business name on them. Frequently this included an address with the city and state, but not always. Pieces which can not be readily attributed to a particular city and state are called "Mavericks". This piece is easy to attribute as the business name and address including city and state are clearly listed. Encased collectors collect pieces in a variety of ways. Many collect just a particular city or state. They probably even collect other tokens from that area as well. Some encased collectors collect by business type. Automobile dealers, banks, or from National Parks. Some collect by date as well trying to get a set of coins by date that are encased. 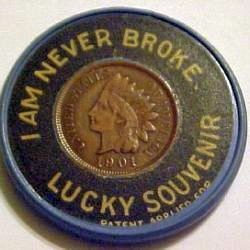 There are as many ways to collect encased coins as there are collectors. 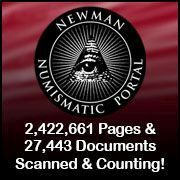 A section has been added for original articles about encased coins. If you would like to submit an article for posting on the web site just email a copy to me at bdperdue@netscape.net. All articles should be original work and will be attributed to the author with all rights reserved.